Are you interested in using DNA to research your family history but don't have a clue where to start? This post will give you some information to answer the question "what's the best DNA test for genealogy." I was going to also include "what happens after I test" but that is a subject for another post. 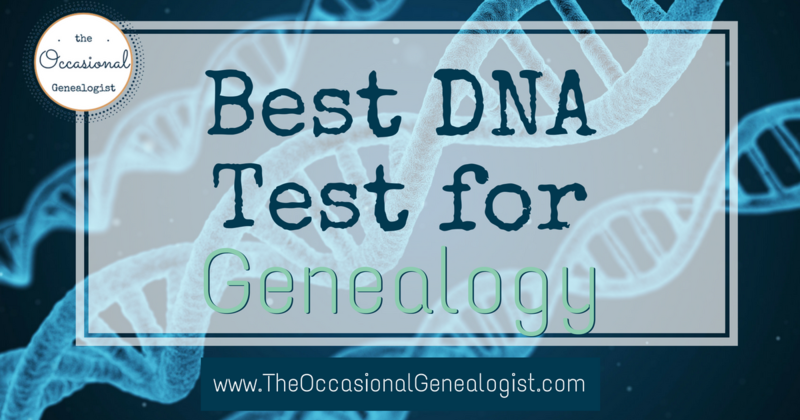 What Is the Best DNA Test for Genealogy? First, there are actually three types of tests you can take. If you know nothing about using DNA for genealogy (referred to as "genetic genealogy"), you are probably thinking about autosomal DNA. That is the type of test you see advertised on T.V. If you're just getting started, here are my recommendations. ONLY company offering all three types of DNA tests, large testee pool. Swab test (anyone can take it), and good in-house tools. Swab test (anyone can take it), fastest turn around time, competitive pricing, good number of attached public trees (plus easy to create your own tree). Good (working towards great) in-house tools. Good for those with lots of non-U.S. research. Largest pool of testees, lots more testees have public trees. Spit test (difficult or impossible for some including the very old/young and people with some medical conditions or on certain medications). Poor in-house tools. Two options (just ancestry or ancestry+health). The place to test if you want the health tests. Spit test (difficult or impossible for some including the very old/young and people with some medical conditions or on certain medications). Biggest learning curve to use their tools. In most cases, you want to take an autosomal test and they are the cheapest. If you become interested in one of the other types of tests, you only have one choice of where to be tested, FamilyTreeDNA. This is important to understand to answer the question "who's best?" because first, you need to know why you're testing. FYI: If you are not American and outside of the U.S., you may not have all four choices (and that could mean you are an American living outside the U.S., not just a citizen and resident of another country. Some companies won't ship a test to other countries---remember, DNA starts to get into areas some governments regulate like healthcare, even though the test is for genealogy). My advice is aimed at Americans because that's my research specialty and my genealogy. In general, it'll apply to anyone but DNA testing is all about who else has tested. And that brings us back to why you're testing. If you have already tested and are working on a special or non-U.S. population and have recommendations for which company is best for that situation, leave a comment at the end of this post! My genealogy isn't going to give me personal experience and I'm unlikely to take clients (since I don't have the experience) for special or non-U.S. populations. Why Take a DNA Test for Genealogy? I'm taking a slightly different approach than some on categorizing your "why test?" response. People often break it down by the different types of information you can get like ethnicity, recent ancestry, distant ancestry, or ancient ancestry. There's even the option of getting warm fuzzies for contributing to science. I'm guessing you're here because you're not a genetic genealogy expert. You might not even be a beginning genealogist. I'm going to try and make this simple so you don't end up overwhelmed (but it's a lot of information!). Learn about your family history but you aren't a genealogist and don't have a specific question you want to answer. Let's look at each of these (or you can just read the ones that apply to you). Are DNA Tests Accurate for Ethnicity? This is an easy answer. No. Not what you were expecting? Ethnicity information, like you hear about on T.V. commercials, comes from autosomal DNA tests. The test is all about statistics (the percent of DNA you match to someone and the percent you should, theoretically, inherit from an ancestor). Ethnicity estimates toss more statistics on top of that. I do not have a biology background. I have a statistics background. After all the trouble of graduate studies, I decided I had enough of statistics. They kinda scare me. I love engineering uses for statistics (how to time a light or where to put luggage trolleys, and how many, in an airport). I do not like statistics used for marketing and politics. No, numbers don't lie. Numbers are numbers. They are meaningless unless you do something with them. And that's where the "lie" comes from. I can make statistics say almost anything I want without fudging the percentages. That's interpretation. You probably aren't going to look into the exact numbers. I don't just mean the percentages given by your testing company, I mean the numbers behind that and behind their sample populations. Yes, it's complex! The numbers behind the interpretation require interpretation. You can interpret them differently but you will need more information and it's a lot of work. If you just HAVE to know what your ethnicity estimates are (notice how the word "estimates" is part of that), I can't really dissuade you. Know this. Your ethnicity estimate from every company will be different. There is a good chance your ethnicity estimates for yourself, parents, and siblings will make it appear you are not genetically related. It's all about statistics. You've inherited SOME DNA from long-ago ancestors. That DNA matches a statistical sampling the company has decided represents an ethnicity. A different company has a different sample (group of people) and may interpret that group as representing a different ethnicity. People move, they migrate, they inter-marry more or less with outsiders. There is a lot going on that affects estimating ethnicity in the 21st century when you care about the 19th century, or the 18th, or 17th, or the 5th century. The science is not bad. The interpretation is difficult. Until we test 1000s of ancient remains from each known ethnicity, time will always affect and alter the information. In fact, each company is giving you an estimate for a different point in time. So they are unlikely to match from one company to the next because all the ancestors you had at different points in human history are different (and not all of them are represented in your spit sample which is why results for siblings and parents differ at the same company). Ethnicity can be used and it can even be helpful with answering specific questions. The ethnicity estimates aren't usually wildly off. Your understanding of them might be. You aren't going to have Scandinavian results for DNA that is from central Africa. You might see European results for African DNA because it's Spanish and Algerian DNA that's mixed up. There's some water there that makes migration possible and even likely. The same is true for northern Europe. One of my major issues with ethnicity results is how they define some of the populations. Modern countries are modern. My paternal side (where I have three tests from "older" relatives) are very strongly based in what is today the U.K. Everyone breaks this area out differently, British, Irish, Celtic, Welsh, Scottish. I'm just confused. How can you have Celtic and Irish, don't those overlap? If not, why haven't you explained it better? And what about the Norman conquest in 1066? That changed the ethnicity. I'm not seeing how that relates. So are my celts after 1066? How can you be sure? Should I be seeing French ancestry or not? Are DNA Tests Accurate for Ancestry? This seems to be a popular search query. I'm not sure if people mean "accurate for ethnicity" which isn't the same. Ethnicity tells you about a group you belong to. With DNA it means people you share DNA with (although you can obviously be raised in an ethnic group without sharing DNA). To me, your ancestry is your genealogy. These are the people you descend from, individuals. Ethnicity is about belonging to a group. Ancestry is about individuals. DNA is accurate for genealogy. Once you do a lot of work. If you share DNA with a person, you are related. Determining how you are related involves doing a lot of analysis and interpretation but it is possible to be really accurate. Will a DNA Test Help Me With My Genealogy? I want to address the last reason first because it's the fastest. Can DNA Give Me a Family Tree? No. In short, DNA requires you have people to compare and then you have to interpret your shared DNA in conjunction with your individual family trees. If you don't have a family tree, you need a lot (and I mean 100s) of people with a tree and compare those trees. I recommend my post "Is DNA the Magic Bullet for Occasional Genealogists?" as it answers this question in more detail. If you don't have a specific question and haven't started researching your own family, DNA will be a tool waiting in your tool shed to be used. It won't magically grow a family tree for you with no effort on your part. Can DNA Tests for Genealogy Help If I'm Adopted? Happily, this answer is yes! It isn't going to be easy unless it just happens that your biological parents, siblings, and/or aunts and uncles have already tested. In most cases, it's just as hard to find an answer if you're adopted if not harder (since you have no tree). On top of the normal genealogy issues of using DNA, you might run into extra denial and lies. If you are an adoptee, don't get into DNA alone. There are wonderful free resources (and volunteers) devoted to helping adoptees use DNA. I actually do not offer any professional DNA services for adoptees because they should first see what's available for free. Professional DNA services are very expensive (because it takes so much time). Note that almost all the free resources (not volunteers, the non-people resources) are resources that can help anyone use DNA. If you have a recent missing relative question, don't overlook those resources just because you aren't an adoptee. It will be clear if anything doesn't apply (or can't be used) by a non-adoptee. This is a little easier to answer since you have a very specific research question, who are your parents. If you have the money, test at all four companies and also have YDNA (if you are male) and mtDNA tested at FamilyTreeDNA. Have some money but not enough for ALL the tests? If you are male and are trying to find your father, have YDNA tested and have an autosomal DNA test done. 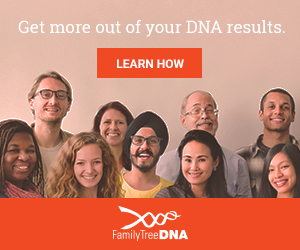 You can have it done at FamilyTreeDNA with your YDNA test or somewhere else. Later you can take more tests. If you are female, I recommend having an autosomal test done at FamilyTreeDNA (called the "FamilyFinder"). I'd also test at one of the other companies. For anyone, you can add mtDNA later when you find you need it. There's also another option but it's a multi-step suggestion (but might be your cheapest option). Test at AncestryDNA, transfer your results to FTDNA and MyHeritageDNA. Upload your results to GEDmatch. Note that to add a YDNA test or mtDNA test later, you will have to take a test at FTDNA, you can't upgrade a transfer since they don't have your spit. You may also want to consider testing any relatives you do know of. More importantly, check out the free resources I've suggested as someone might sit down with you and create a customized testing plan. 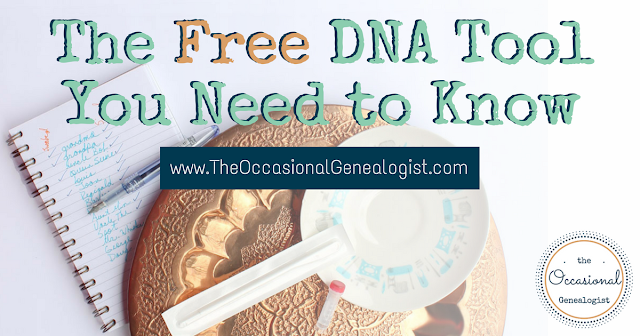 I'm not recommending more steps because you should be checking out those free DNA resources! How Does DNA Help with Genealogy? OK, so if you have a specific genealogy question you want to answer and you're not an adoptee, this section is for you. To determine which DNA test is best, you need to define your genealogy question. There are three types of DNA tests and one might be better for your question than another. This is called formulating a testing strategy (there are lots of great online sources about this so now you know what it's called). I'll first explain the different types of tests. Your three types of test are autosomal (often abbreviated atDNA), Y (YDNA or Y-DNA), and mitochondrial (mtDNA). These are the types you can purchase a test kit for. There is also XDNA but it is tested with atDNA so don't go looking for a separate test for it. I am not going to get really scientific about each type of DNA. There are people (and therefore blog posts) that can give you all the biological nitty-gritty but I hated biology class, except for the part about DNA. I don't want to explain the science behind how we have each type. You can learn that if you choose or if you need to. You need to understand the basics of how we get our different types of DNA, though. Note: Have you noticed there is no "paternity test" DNA mentioned? That is not a type of test for genealogy. If you want a paternity test, go to the local drugstore and purchase a paternity test kit or find a testing center, that's not what this post is about. A paternity test is a different type of test as is the type of DNA testing you see done on crime shows. If you're interested in family history, you want atDNA, YDNA, or mtDNA. You'll see in the following explanations that these tests won't tell you exactly who your father is---i.e. not a paternity test. Back to the (very) basics. I'll start with the least helpful test for a non-genealogist (I'll explain in a moment, stick with me). Mitochondrial DNA is the DNA you inherit from your mother and she got it from her mother who got it from her mother and so on. Do you see the limitation? This will only track a lineage in your family. You will also only find mtDNA helpful many, many generations back (if you want details about how far back, Google information on mtDNA specifically, this post isn't that detailed). If you have not done any genealogy research on your family, don't take a mtDNA test (or take all the types and come back to use your mtDNA results later). MtDNA won't help until you've done a lot of research. Don't get confused, mtDNA is NOT the same as XDNA. Recap: mtDNA traces a lineage, your mother's, mother's, mother's lineage. It is helpful for many generations back, more generations than the average casual researcher has found. This is not a good first test unless it answers a very specific question. See the section about mutations below. It explains why mtDNA helps match you to people many generations back. YDNA is similar to mtDNA in it only traces a lineage but only men have YDNA (remember learning about chromosomes, everyone has an X chromosome, only males have a Y). A man got his YDNA from his father who got it from his father, etc. Once again, this only traces that lineage. Y is more useful because it reveals ancestors most genealogists are working on and can reveal non-paternity events (this includes illegitimacies in your YDNA lineage but could be for other reasons, it won't reveal cases where the brother or paternal cousin is the father, i.e. a man with the same YDNA is the father). This is not like a paternity test. In fact, you can have a minor mismatch with your father and it has no meaning, he's still your father. Y- and mtDNA tests are based on tracking mutations in the tested type of DNA. Once again, I'm not going into great details but you have to understand the basic concept to understand how the different tests can help you. Mutations in mtDNA are very slow. That means you should perfectly match everyone with shared mtDNA for a very long time. (There are some very specific exceptions, see this article on mtDNA heteroplasmies and/or this article if you want to know more, much more). In my personal research, "how far back" goes farther back than I've researched my mtDNA lineage. So it won't help me unless I get lucky and have a more recent mutation. There is the exception where mtDNA can help you exclude people. 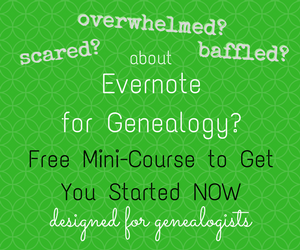 This is not something most non- or beginning genealogists can benefit from. There are cases where it will help. This is why it's crucial to know why you are having DNA tested. You need a question you are trying to answer so you can formulate a helpful testing plan. YDNA mutates a bit faster. This lines up exactly with the time period where I'm stuck on that lineage. I had my dad tested (since I'm female and have no brothers). It's his 4th great-grandfather we are working on. YDNA won't help with a genealogical problem really recently unless you don't know the surname for your YDNA line (for any reason including adoption or illegitimacy). Why I've stopped to talk about mutations is, it is possible a YDNA mutation can occur between a father and son. It even happens sometimes that two mutations occur. It is very unlikely (but possible) one mtDNA mutation will occur between mother and child and extremely unlikely two will occur (see the two articles about mtDNA heteroplasmies above to understand a common exception that happens in reporting). You need to understand some of the details when you have multiple relatives tested. Each test works a bit differently so you don't want to panic about grandma being unfaithful to grandpa and getting your family in a tizzy because you didn't understand what you were doing. Genealogical DNA testing is not like a paternity test! YDNA recap: YDNA is easy to use and can be a good first DNA test. However, it only traces a lineage (your father's, father's, father's, etc.) so it has to be the right choice for the problem you are trying to solve. Autosomal DNA is the new kid on the block and the most popular. Why? It doesn't just help with one lineage like YDNA or mtDNA. It is also most helpful for recent generations. In fact, because of the way atDNA is inherited, it isn't helpful for most problems beyond about five generations from the testee. But it does help with some. Statistics are the big driving force with atDNA (they are with mtDNA and YDNA, too, but not as much because of the differences in how they work). You inherit half (50%) of your atDNA from each parent who got 50% from each of their parents, etc., etc., etc. But you got a random selection of each parents' atDNA. Statistically, you should have 25% of your atDNA from each grandparent. That's how relationships are estimated when using atDNA. Someone you share 25% of your atDNA with and is old enough will be estimated to be your grandparent. If they are much younger than you, it'd be estimated they are your grandchild. But the reality is, it's all random. You will have 50% from each parent. Beyond that, it's all chance. Think about it. You could have 100% of the same atDNA as your sibling (even if you're not twins, this is just one type of DNA in your body). You could also have 0%, you each got the opposite halves from each parent. Rarely is it as extreme as 100% or 0% but you get the idea. And this applies to every generation. So your dad and aunt could be very similar or very different or right on average or anywhere in-between. There are several different ways this can be illustrated but it comes down to this. When you go more than four or five generations back, you didn't inherit some DNA from those ancestors. Statistically, you divide the percentage in half each generation you go back. Remember, I said it's random in reality. You don't have exactly 25% from each grandparent. You might have only 15% from one and maybe all of that came from one of her parents (it happens). That would mean you have no DNA shared with one of your great-grandparents so you can't have any from older generations in that branch. Even if you have a tiny bit of DNA shared with an ancestor, you aren't comparing to someone who has been dead for 100 years. You are comparing to another descendant of that person. Do you see why this gets complicated? The other person also inherited a random amount of atDNA from your shared ancestor. With mtDNA or YDNA you know in which lineage you have the shared ancestor. With atDNA, you don't know (note: after enough analysis you can map your chromosomes so you know which segment of DNA you got from each ancestor and then you will know which branch or ancestor you share; initially you have no idea). With a very small amount of atDNA, it often isn't possible to determine where you got it from. So for ancestors in more distant generations, even if you inherited some atDNA, you won't be able to find matches that descended from the same person. If by chance you have very little atDNA from more recent ancestors, the same applies. What does all this mean when you're choosing the type of atDNA to test? AtDNA has the potential to help you identify new ancestors in any branch of your family tree. This is only potential, in reality, there are ancestors you will have no atDNA from or too little for atDNA to help. However, you will also have random branches where you have a lot more atDNA. Why should you use atDNA? You don't know which branches it will help with. The tests are cheap enough it's worth the investment. Also, you should test as many relatives as possible. Everyone has different amounts of atDNA from their various relatives. Whenever you have the option, test your older relatives (by generation, not age). If you are trying to determine a budget, don't test children of two parents who have been tested (or children of someone you tested if you aren't interested in the untested parent). When I say children, I don't mean minors, I mean descendants. You have to have the atDNA of your parents so you won't get anything "new" by testing descendants. Instead, test siblings and cousins who can have untested atDNA segments. One of the huge advantages of atDNA is the low cost. Recently prices dipped under $50 during a major sale (when all four companies were really competing with their sale prices). One of the disadvantages of atDNA is its random nature. That means you really need to test a lot of people. Luckily the combination of low prices and the need to test a lot of people is a good thing. But you still want to make the best use of your money. For most genealogical questions, you're going to want to use atDNA. If the question is within three generations of the person being tested, you really want to use atDNA, Y and mt may not help at all (mtDNA really is unlikely to help unless it's being used to exclude women from your tree). If you have a question where YDNA can help, you want to have money available to test the appropriate people. Remember, you can have someone else tested. If you're female, don't ignore YDNA just because you can't take the test. With really complex DNA projects, genealogists may do a great deal of research to identify a stranger they can have tested (this applies to all types of DNA but Y is so easy to use, it's reasonable for a novice to try). 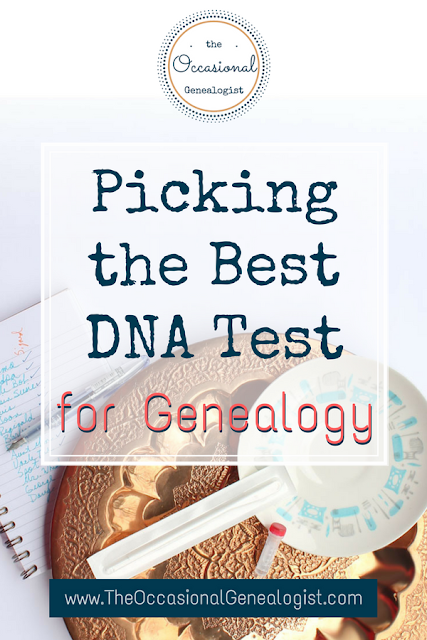 Formulating a testing plan can be complex, especially if you are new to genealogy. This is a service many professional genetic genealogists offer. 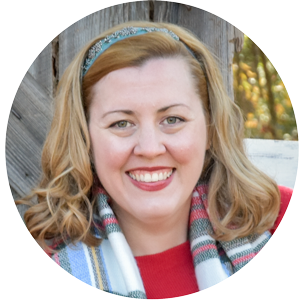 If you are an adoptee, check-out the free resources I mentioned. Because that is a very specific question, you may be able to find a pretty specific testing plan without needing it customized just for you. This post gives a farily in-depth discusion of creating a DNA testing plan. There are essentially two scenarios you could be in. You have a very specific research question involving one person or couple (i.e. the question is for one lineage in your family although it may "branch" to any ancestors of the focus person/couple). This includes adoption problems, that question is the parentage of the adoptee. You are interested in your genealogy in general. It could be your entire tree or multiple branches. You want to formulate a very specific testing plan, set a budget, and prepare to contact relatives. You need to focus on who can be tested that is related to the focus person/couple. Don't just test everyone related to you unless you have plenty of money, focus! Consider if you have the option of using YDNA or mtDNA. Since mtDNA is less likely to be helpful, I'm going to focus on YDNA so I can be a bit more specific. MtDNA is often used for more advanced projects and this post isn't meant for that level of genetic genealogy. If you don't know anyone that could take a YDNA test for your problem, consider it from the other side. Is your focus person male? Did he have any sons? Look for a continuous male line using reverse genealogy (research the descendants instead of the ancestors). If your focus person is female, does she have brothers who had sons? Make sure you aren't thrown off by half-siblings who won't have the YDNA lineage you need. If you are focusing on a woman with no known siblings (or only sisters), you can exclude using YDNA for now. It's possible you might want to use YDNA later (perhaps when you move one or two generations back). This might also be a situation where you would want to use mtDNA but I'm not going into detail due to the complexity (is it enough generations back, could it be used to exclude women, etc.). For atDNA, you want to identify appropriate testees. To spend your money wisely, apply the suggestions I made before (about not testing children who's parents are tested). I'll be more specific in the next section about answering a non-specific question (does that make sense!). Read that as it will specify some specific "where to test" information. Just remember you only want to test people who's DNA relates to your problem. With a specific question, if the focus person/couple is in your paternal tree, don't spend your limited budget on your maternal relatives and vice versa. The general concepts listed below apply, you just want to identify the relatives who's DNA will help with your specific question. This is "getting started" advice. You may find after working with DNA results that you have a specific question and then you'd want to follow the suggestions under option 1. First things first, consider your budget. Testing yourself isn't always the best option when you have a limited budget. If you can test your parents, do it. If not, then test yourself. In general, I recommend aiming for two atDNA tests as a starting point. This isn't advice for adoptees and if what I suggest is impossible, adjust. First, get two tests from people in your direct line aiming for the oldest people (by generation, not age) who should have the ancestors you are interested in. (Note: the biggest "risk" in choosing another relative to test is if there is any chance there was a recent "non-paternity event." That means is there an unknown adoption or an illegitimacy. You know if there are whispers in your family of such events so don't open a can of worms if you know it's there! Genetic genealogy always has a chance of opening a can of worms, usually it's either a complete surprise, or that is the reason someone is taking a DNA test. Ideally, you would test either all four of your grandparents (and great-grandparents if that's an option) or both of your parents. However, many people interested in genealogy don't have that choice. In that case, test yourself as one of your two main tests. Remember, this is advice for people who have a broad interest in their family tree, not a specific question and are not adoptees. There are a few variations that are "best" depending on who is available to test. Rather than keep saying "test your parent" or a variation, let's just consider who is the oldest direct ancestor that is available. If you can't test both people from the ancestral couple, test the one and a child. So this could be one grandparent and your parent that is their child or one grandparent and your aunt/uncle that is their child, this might also be one of your parents and yourself. If you can afford more tests, test the person and all their siblings. This could also be testing the person and all the siblings of their deceased spouse. I often see people who tested him-/herself and several of their children. A better use of your money would be to test yourself and all your siblings, unless you have to test your child to get DNA from their other parent. There are of course situations where you need to test your child to obtain certain DNA but if that's not the case, seriously consider spending the money for that test on an older relative (even if "older" is your siblings). This is why a testing plan is important. Do you need to test your children or grandchildren? Even if you are interested in researching the parts of their family tree they don't share with you, if you can test their older (by generation) ancestors, this will give you better results. 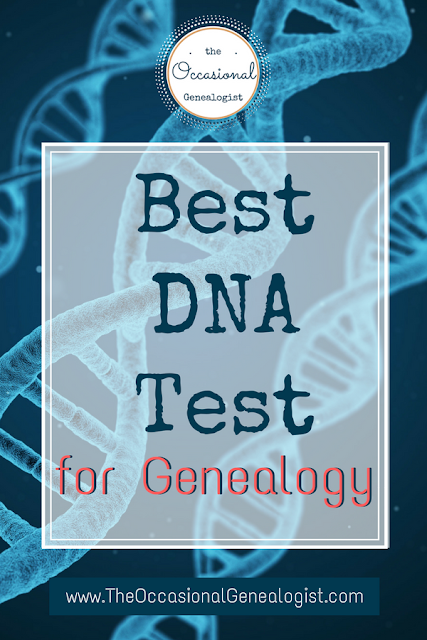 If you're just looking for a Christmas gift because you don't know what to get them, that's a reason to test them (but is not best for your genealogy---so know WHY you are spending the money on a test). If you have a broad interest but not in your whole tree, say your paternal side, only, look for other good candidates to test in addition to your parent/grandparents, or yourself. Siblings of your grandparents are a great additional test. They may have DNA your grandparent didn't have (and therefore your parent and yourself can't have) but they only have ancestors you are interested in (as opposed to your cousins of any degree who have branches not related to you). People often overlook those great-aunts and uncles. Test them while you can! You should also be saving up to test your "removed" cousins. Your parents and grandparents first cousins can help your genetic genealogy research significantly. These are your first cousins once and twice removed. Second cousins can actually make research easier by helping you group matches more specifically than using your closer relatives. If you have a research interest, like your paternal side, or the ancestors of a specific grandparent, but it isn't a specific research question, you might have an older relative that is the perfect second test in addition to your or your parent's test. I focus on my great-aunt's test because my main research interest is in all of her ancestors (the ancestors of my paternal grandfather). My brick walls are almost all within the range where she should have DNA from those ancestors, but my father is unlikely to have DNA from some of them. The combination of the two tests, my father and his paternal aunt (plus I tested her first cousin, later), gives me lots of matches just for that side of my family. I had a research interest but not one problem I wanted to focus all my money on. However, I've now found my great-aunt didn't seem to inherit a lot of DNA from her maternal grandfather. That is the branch that ranks second in research interests, or maybe "second" is now the mysterious connection to a family that DNA revealed (i.e. I've found an ancestor from DNA that I don't know how he fits in our tree, except that it's on my aunt's maternal side). Because I did focused testing, but not with the goal of answering one problem, I now know I want to focus on my grandfather's maternal line. Originally I was planning on focusing on his paternal line but I wanted to test my older relatives, first, regardless of branch. I believe I need to do more traditional research on the paternal branch but more DNA testing will help with the maternal branch. How I want to spend my money on DNA has shifted because I had a plan. If I had one question I absolutely wanted to answer first, I would have done things differently. You need to make the same kind of intentional decisions. Remember, if you are on a budget, don't waste your limited resources testing people who's DNA is already represented with another test. That means don't test children of two people you've tested or children of someone who is the one parent/grandparent you are interested in and they were tested. Direct descendants can not have DNA their direct ancestors did not have. So a child only has (less) DNA than their parents. You won't get anything new by testing them when both parents are tested, you will actually get less. Instead, test collaterally to try and get additional DNA. For example, if you were able to test one grandparent but you are interested in both grandparents, it's worthwhile to test two children of that couple. They may have different DNA from the untested parent. So that might be your parent and your aunt or uncle. With genetic genealogy it's just as important to test the siblings as it is to research the siblings in traditional genealogy. Remember to consider the siblings of each generation (so various types of aunts and uncles) and also consider cousins (1st, 2nd, and removed) that are older generationally when the great-aunts and uncles are deceased. As a reminder, you may need to use FamilyTreeDNA or MyHeritageDNA (the companies offering a swab test) for older relatives. Anyone that is able to take a DNA test can take a swab test. Some people can not produce enough saliva for a spit test (AncestryDNA and 23andMe). My testing plan going forward, now that I have a good number of close relatives tested, is to use FamilyTreeDNA. Then I have the option of adding a YDNA or mtDNA test to specific people, later. This doesn't require I know who right now. If you're still working on those first few tests, which company do you test with? Which DNA Testing Company is Best? I've now talked about all the reasons behind choosing a best company. There isn't really a "best." The results will all vary slightly. That's not because one is better than another. It's because the results you get back aren't raw DNA. They have interpretation applied to them and each company interprets the information a little differently. If you read reviews of DNA companies, from casual users, you will see all kinds of accusations of "wrong" results. DNA results are almost never "wrong." Your understanding of what they are telling you is usually what's wrong (sorry, that's the cold hard truth). That is a subject for another post. I actually don't recommend choosing a testing company based on reviews (normally I'm all about reading Amazon reviews before purchasing but I've read the reviews on DNA kits and mostly, the people don't know very much about genetic genealogy so the reviews are wrong). If you can, have someone test at each company, that increases the matches you get. Some people may have to test at FamilyTreeDNA or MyHeritageDNA because they need to take a swab test. As mentioned before, I highly recommend having older relatives, who you might later want a YDNA or mtDNA test from, tested at FamilyTreeDNA. Their sample will be stored so you don't have to retest to have the added type of test done. This only applies to tests taken directly from FamilyTreeDNA, not to transfers (which I'm about to talk about). Transfers don't provide the physical DNA sample that is needed for the additional test (it only transfers data, not physical DNA). There is a great "budget" option you can use but make sure you don't miss out on the option to get YDNA or mtDNA because you use this too much. I've had both of the main relatives who's results I'm interested in die since I tested them. I'm kicking myself because one was tested at AncestryDNA and now I realize I needed her for specific mtDNA results, but it's too late. By using transfers, you can get the benefits of testing at three companies for just over the cost of one test. Note that the cost of transfers may change but is likely still the best budget option. You just might not find the exact financial situation I describe. If you test at AncestryDNA, you can transfer your results to MyHeritageDNA and FamilyTreeDNA for free. There is a nominal charge at FamilyTreeDNA to unlock your full results. I recommend going ahead and doing the free transfer even if you don't want to pay for the unlock fee. It takes time to process the results so you'll save a little time doing this in stages. If transfers were not an option, I would recommend only testing one key person at AncestryDNA because they provide very few tools and none of the key tools you need to do true DNA analysis. They do have tons of family trees which are the first tool you'll use, though. However, you cannot transfer to AncestryDNA (or 23andMe). By testing at AncestryDNA and transferring to FamilyTreeDNA and MyHeritageDNA, you will get the advantages of "testing" at all three companies for the cost of the AncestryDNA test plus the transfer costs. You will get access to all the tools at FamilyTreeDNA and MyHeritageDNA plus you'll see all the matches at those companies (many of which you won't find elsewhere). MyHeritageDNA has really been uping their game as far as the tools they provide. Right now, I would recommend them as my top choice based on available family trees plus tools. This post isn't going to go into detail but there are also additional sites where you can upload your results. You can see my post about what is GEDmatch but there is also DNAgedcom (which is a great site to use in addition to GEDmatch). Both are volunteer efforts and for DNAgedcom that means they started with a focus on FamilyTreeDNA. By transferring to FamilyTreeDNA, you can then upload your FamilyTreeDNA results to DNAgedcom just as if you'd tested directly with them. Basically, there are multiple advantages to having results at multiple companies. If you can't afford to test with each, test at AncestryDNA and transfer results. Make sure you've transferred results between any companies you can (you can transfer from FamilyTreeDNA to MyHeritageDNA, and it's really easy to transfer from MyHeritageDNA to FamilyTreeDNA, this may change over time so look into options for "autosomal transfers" at each company). Finally, my recommendation is to buy your AncestryDNA test when it's on sale and from Amazon. Make sure you are getting a kit sold by Ancestry and fulfilled by Amazon. See my post about getting the best price (and what to look out for), "How to Do Genetic Genealogy on the Cheap." This includes details about who else is available via Amazon and who you shouldn't purchase there. What's the Best DNA Test for Genealogy? Who's the best? You should now know it depends on why you're testing. Know why you're testing, are you answering a specific question, curious about your ethnicity, just interested in your family tree, or just desperate for a Christmas present? Have a testing plan. Don't test people who's DNA is better represented by older (by generational) tests unless it is for a specific reason as defined in your "why." Choose your testing company carefully. Not because the quality is different, but because you can get a better value testing one way, but different types of DNA by testing another way. Wait for a sale. DNA tests go on sale multiple times a year. You may be able to test more people by taking advantage of sales. Don't forget to consider your transfer options and the cost of shipping. This should all be part of your testing plan. If you're an adoptee or working on a recent unknown parentage problem, check out DNAadoption for lots of free resources.